A fun, fast and exhilarating game that is played in teams, with the primary aim of knocking out your opponents by throwing a foam ball at your opponent. Once hit they are 'out' but be careful, if they catch the ball it's not them that's out but you! 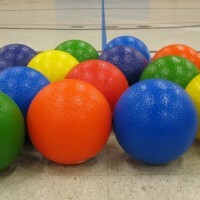 A game for all ages, abilities and occasions, dodgeball is fun, fast and exhilarating. Dodgeball is a flexible game that is played in teams, with the primary aim of knocking out your opponents. This is achieved by throwing a rubber coated foam ball at your opponent. Once hit they are 'out' but be careful, if they catch the ball it's not them that's out but you! There is no dodging the issue, this is a great game for all kinds of parties for adults and children alike, from birthday celebrations to stag weekends and hen dos. Book this activity alone, with another or why not make a package including accommodation and night life?